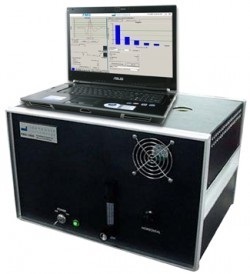 The FMS-Water Activity Analyzer is a non-destructive gas analyzer for making water activity (% RH) measurements of solid dosage drug product samples. This compact analyzer utilizes a patented laser absorption technique developed with funding from the Food and Drug Administration. Light from a near-infrared laser is tuned to match an internal absorption frequency of the water vapor molecule and passed through a glass sample container in the headspace above the product. The amount of laser light absorbed is proportional to the water vapor concentration in the headspace which in turn can be directly related to the water activity of the pharmaceutical solid. The use of a temperature controller for the sample housing enables measurements at defined temperature. The non-destructive nature of the measurement method enables a broad range of moisture activity applications and offers significant advantages over traditional techniques. The water activity analyzer is used for development & QC laboratory applications as well as for at-line in-process control of tabletting processes in production. Systems can be permanently situated in laboratories for product development, release testing, and QC investigations or implemented at-line for in-process monitoring and troubleshooting activities.